Captain, Co. C, 4th Del. Inf. Brevet Major. U. S. Vols. Born at Wilmington, Del., April 20. 1841. 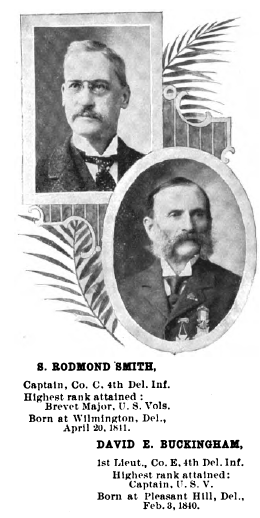 1st Lieut., Co. E, 4th Del. Inf. Bom at Pleasant Hill, Del., Feb. 3, 1840. During the siege of Petersburg, Va., which commenced with the investment of that city by the Federal forces during the early part of June, 1864, it became the aim of General Grant to flank the position of the enemy by swinging to the left. In the execution of this movement on Feb. 5, 1865, occurred the action at Monk’s Neck crossing of the Rowanty River, Va., and the engagement at Hatcher’s Run on the following day. “To the Fifth Army Corps was assigned the duty of initiating this movement, and the third brigade of the second division of this corps was under arms, with tents struck and three days’ rations in their haversacks, all the preceding night, and about sunrise on the morning of the 5th was marching by the Halifax Road to the west for Monk’s Neck Crossing. About eight o’clock A. M. the brigade was halted in the road about a quarter of a mile east of our objective point. It was ascertained that the bridge over the crossing had been burned to prevent the passage of our troops, and that substantial entrenchments had been erected on the bluff bordering the margin of the stream on the opposite side. A regiment of Pennsylvania “Bucktails,” [the 190th Pennsylvania] out of our brigade, was detailed to cross the stream and carry the works. After some heavy firing the Bucktails were compelled to retire. “Our regiment, with Major D[aniel]. H. Kent in command, was then detailed for the service, and immediately moved down the road toward the crossing. The ground was slightly rolling and open farmland, except near the bank of the stream, where a thin skirt of trees bordered the river, affording some cover. Major Kent, finding that the bridge was destroyed, filed the regiment to the right, under heavy fire, but somewhat protected by the trees. He then endeavored to lead the regiment across the river, but was shot while swimming his horse and was carried to the rear. ‘You are expected to carry the bridge, if you lose every man!’ I knew that such an order meant business, and as we broke into a double-quick and came under fire the men gave a lusty cheer, and down the road we went with Major Kent riding at my side. We reached the bridge only to discover that it had been effectually destroyed, filed to the right, and as soon as we had cleared the road and were fairly in the meadow filed to the left, and in a moment were at the water’s edge. “The general’s command was ringing in my ear: ‘Carry the bridge if you lose every man.’ It was no time to hesitate or turn back. Three thousand men, our entire brigade, lined the meadow lands, protected by the trees, and a terrible fusillade was going on. I stepped on the ice, which extended only six feet from the shore. It broke under my weight and I struck out for the rebel side and was soon beyond my depth, but I swam to the south side, the Minie balls skimming the water all around me. “Reaching the bank, I clutched a projecting stump root and took a view of the situation from the water. 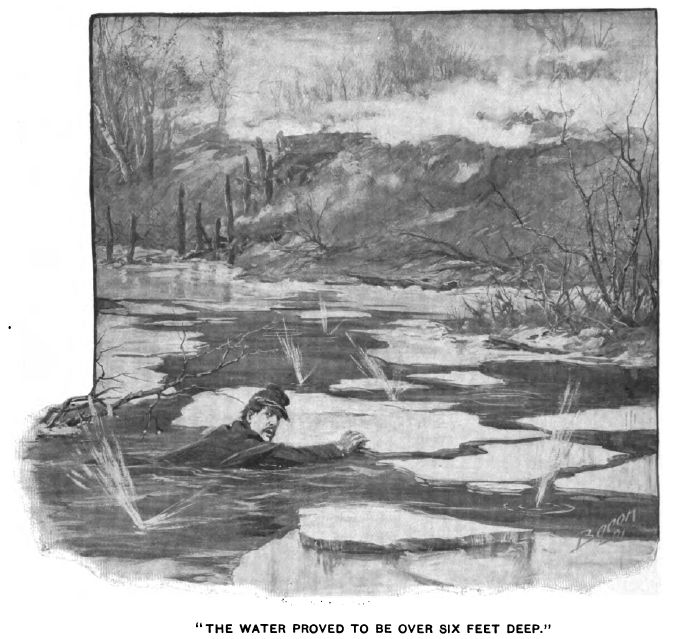 Harvey Durnall, John Bradford and Holton Yarnall, of my command, waded in up to their waists, but, discovering the depth of the stream, fell back. In the meantime Major Kent had been dangerously wounded while urging his horse into the water. The water was icy cold and I did not care to scale the bank, as I was the only man of the command who crossed the river at the bridge, having carried the ford, and the freezing question—not the burning one—was, could I hold it? “There I remained, waiting for reinforcements, for at least fifteen minutes. But our boys were not idle; far up the stream they had been crossing on felled trees and on the ice, and soon I heard them charging down the Confederate side. When the enemy discovered they were flanked they beat a retreat and the bridge was ours.